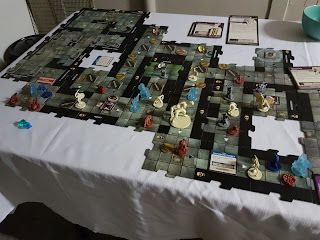 After spending countless hours traversing the dark dungeons of Ravenloft, our party of avid adventurers finally managed to lay waste to Strahd and his evil minions. We cheered, we feasted and celebrated our victory amid the ruins of this once mighty castle and then, sadly, we all went home. So, this being my first custom campaign, it is most likely rife with error and human stupidity. That said, I have played through it a few times and it actually (remarkably) works. I wanted a challenge, so I opted for a semi-pre-built board (explained later on) and almost ALL of the components. Yes. ALL. Years have passed since the defeat of the defeat of Strahd, the former master of Ravenloft. In Barovia, all is at peace and the fear long forgotten. But the presence of evil still permeates from within the forbidden castle and one villager in particular find himself drawn to the darkness. Kavan, having been tainted by the vampiric curse in the past now finds himself mad with a blood-lust that has him wondering the dark dungeons of Ravenloft. The evil within the abandoned castle has awoken. It senses the presence of a new master. 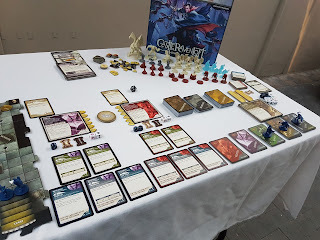 Kavan seeks to reclaim the throne of Ravenloft as his own! 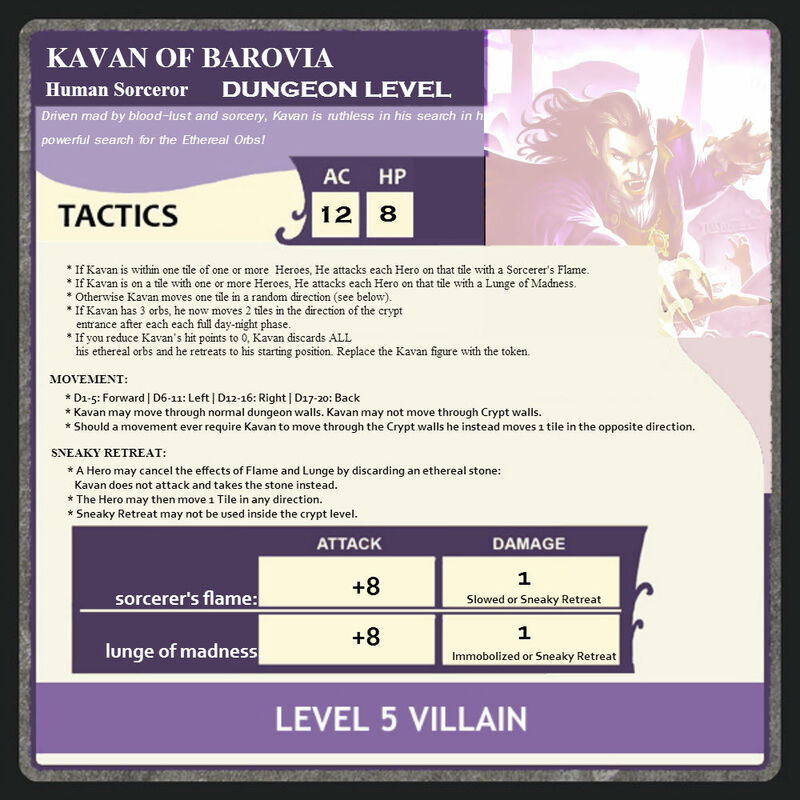 Driven by madness & bewitched by sorcery, Kavan plans to unleash the full fury of Ravenloft upon the village of Barovia. To do so he needs to enter into the crypts below the castle and complete the dark ritual to transform himself into the Vampire Lord. The cleric of Barovia, sensing the awakened evil, has magically secured entry to the crypts with an ancient spell by hiding seven ethereal orbs in the darkest corners of the castle. Objective: Collect 5 ethereal orbs and break the binding spell, allowing you entry to the crypts. Then desecrate all the tombs to end the darkness of Ravenloft for good. NOTE: A single hero may only carry up to three Orbs at a time. You may however, drop orbs on any tile to collect later on. But note that should Kavan reach that tile, he will claim the orb for himself! Group play: 2-5 heroes. 4 Healing surge tokens. Solo play: 2 heroes double handed. 3 Healing surge tokens, Follow a similar setup as in Adventure 7 but with 2 heroes instead of 1. When a hero dies, complete the current villain phase and place a new hero on the start tile. A dead hero’s corpse may be salvaged by visiting the tile where the corpse lays. All items, including ethereal orbs may be picked up and assigned to a new hero. The Arcane Circle, Fetid Den, Dark Fountain, Laboratory, Rotting Nook and Workshop. 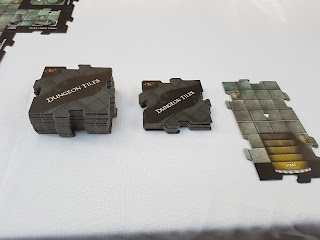 Shuffle the remaining dungeon tile stack. Then, from the start tile, draw three tiles and build on to two unexplored edges of the starting tile.Then draw one tile from the ethereal deck and add it to any unexplored edge of the third tile. 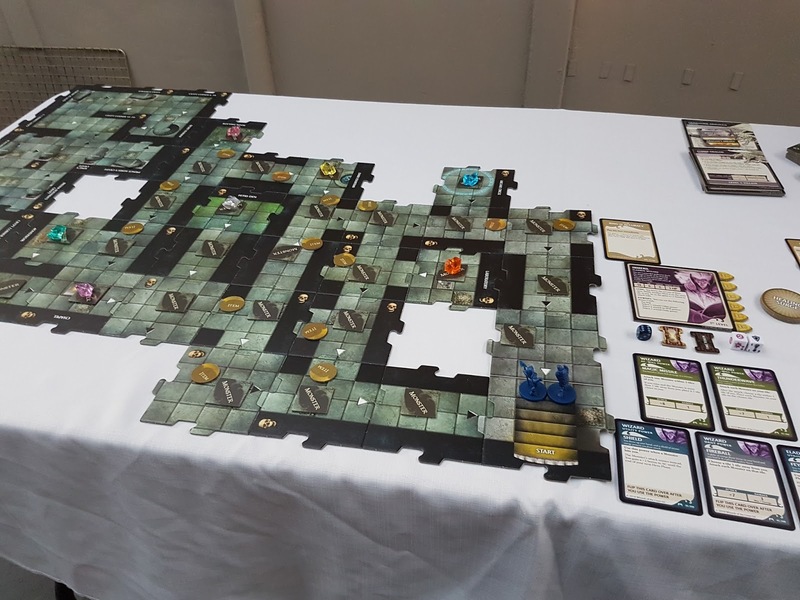 Draw three more tiles, alternating with one tile from the ethereal deck and building up the dungeon lair at random until you join up with the crypts. Monster tokens: Shuffle all monster (not villain) tokens and place them on each normal (not ethereal) tile after the start tile until you have exhausted all tiles (Be sure to include the crypts as well but omit the start tile and the secret stairway tile). Villain tokens: Shuffle the Kobold Sorcerer, Young Vampire, Werewolf, Flesh Golem, Howling Hag (use only 1 token - see her special rules under the villains section), Zombie Dragon and Dracholich tokens and place one face down on each of the special ethereal tiles. See the villains section for special monster rules. Ethereal orbs: Place one of the seven orbs on each of the ethereal tiles. Item tokens: Shuffle all item tokens and place them on each normal tile after the start tile until you have exhausted all. Kavan token: Place the Kavan token on the tile just outside the barred crypt entrance. Kavan activates after a full day-night cycle. Kavan activates at the end of one full day-night cycle and moves one tile in a random direction (see the Kavan villain card for rulings on his movement). Kavan may move through walls. If Kavan lands on an ethereal tile, he gains the orb. If he collects 3 orbs he gains an entry to the crypts. When you encounter Kavan: (When a hero lands on a tile with the Kavan token) Replace the Kavan token with the Kavan figure* and card. Kavan activates at the start of each hero’s villain phase. This adventure occurs over a day and night cycle. Use the time tokens to keep track of a cycle. One full cycle = when all heroes go through two full phases (hero, explore, villain etc). One phase being a day phase and the other a night phase. Whenever a hero lands on a dungeon tile with a monster token, flip the token as part of the hero’s exploration phase action and replace it with the appropriate number of monsters. A hero must either explore if there is a monster token on that tile or draw an encounter card. Whenever a hero lands on/ explores a tile with a black arrow,an encounter card is drawn. If a hero ends his hero phase adjacent to an item, he may collect it and take the items’ treasure card for himself. Mirror: Illusion: Use this item when any undead monster/ villain attacks you. 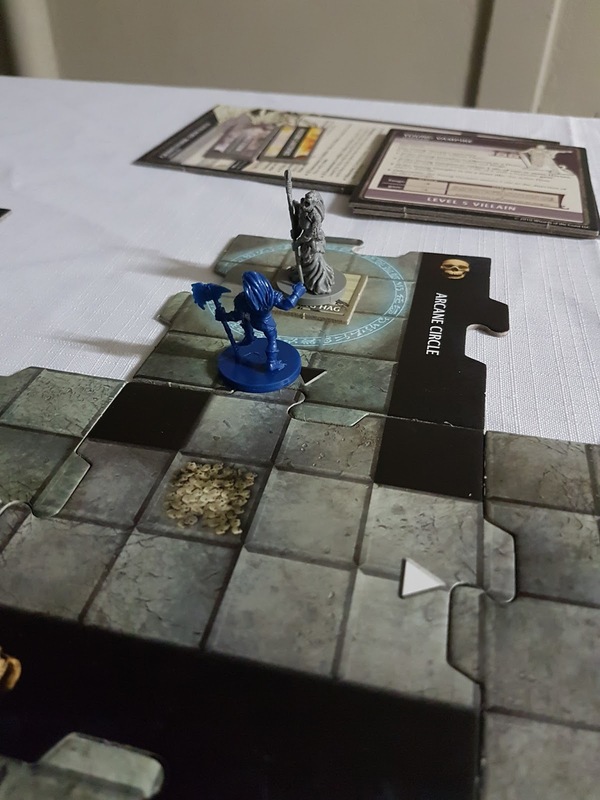 The attack misses and you may place the creature within two tiles of the active hero. Discard this item afterwards. Portrait: Pacify: Use during your hero phase on Villains only. The villain does not activate this turn. Discard the item afterwards. Skull: Ancient Bones: Use during your hero phase. Each undead monster in play takes one damage. Discard this card afterwards. Food: Sustenance: Use during your hero phase. Roll 1D6. Your entire party regains hit points to the value of that roll. Discard afterwards. Animal: Fear of Cats: Whenever you would place a new monster you may instead place the animal token. Any monster that moves onto the tile with Fear of Cats takes 2 damage. Ethereal tiles are ‘guarded’ by a villain. 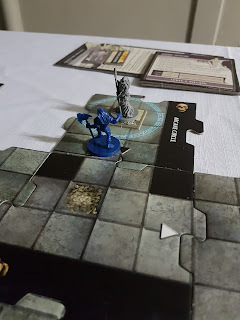 Whenever a hero explores an ethereal tile to claim an orb, the villain is awakened. Replace the token with the appropriate villain figure and card and the villain activates at the start of each hero’s villain phase. Kavan does not awaken villains when he explores ethereal tiles. No encounter cards are drawn for exploring ethereal tiles. A hero may spend 5XP to ‘reveal’ a villain token. The token remains face-down afterwards. Freezing cloud (D1-D15): Any Monsters within one tile of that hero do not activate this turn. Sun token (D16-D20): 2 Damage to undead monsters and vampires (or one damage to other monsters) within two tiles of a hero. Note: You may only use ethereal magic once per orb. Howling Hag: Because all the crypt tiles are sealed, the Hag's teleporting curse instead pushes a Hero DX tiles in a random direction where X is the number rolled on a normal D6 die. Howling Hag: If the Hag has no path to a hero, she moves one 1 tile in the direction of the closest hero. 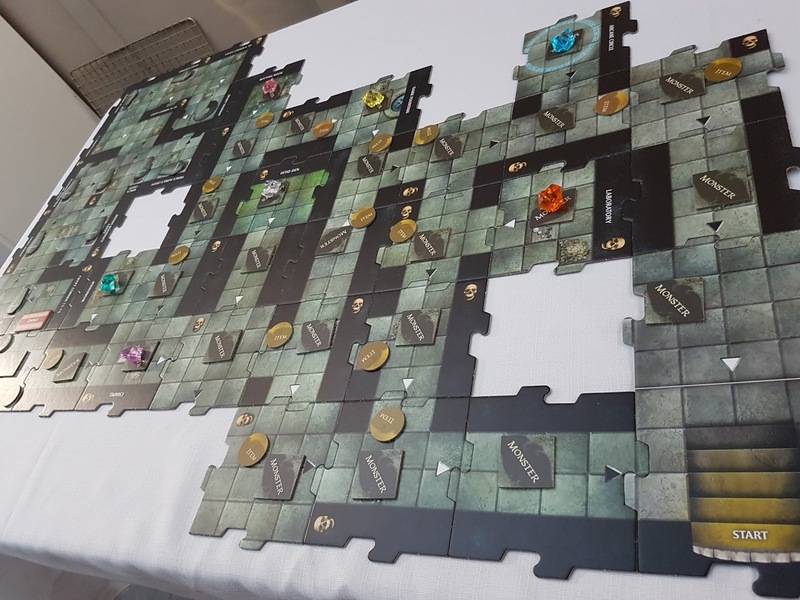 Gravestorm, Zombie Dragon and Flesh Golem may not occupy a tile with another villain. The magic of the orbs breaks the ancient binding curse and the passage to the dark crypts opens...behind you the screams of rage and evil howl as Kavan summons his dark horde to attack! Make haste to Strahd’s tomb! Roll a D6 and randomly select that many monsters (minimum of two). 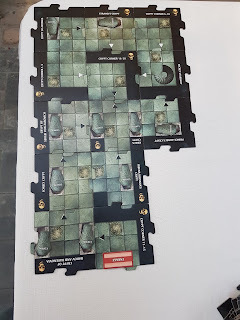 Place the monsters and Kavan two tiles from the crypt entrance tile and replace the Kavan token with the Kavan figure. The castle is seeking a new Master! Kavan activates at the start of each hero’s villain phase. To stop Kavan from completing his final transformation, destroy the coffins by performing an attack action (like with Gravestorm’s phylactery). Draw an encounter card for each black arrow tile inside the crypts. If Kavan is on any tile with an undesecrated tomb at the end of the current hero phase, Kavan gains the vampiric undead power of that tomb. Place the coffin on Kavan’s card. If Kavan has 6 or more coffins on his card he transforms into the ultimate Darkness and the heroes lose the game. Note: Villains may also enter into the crypts to hunt you. The Heroes win the scenario if all the tombs and Kavan are destroyed.